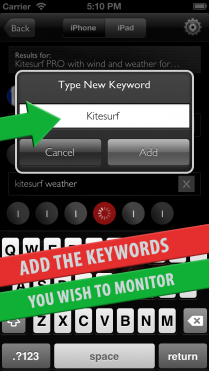 Keywords Spy is an App for monitoring your Keywords Rankings and Chart Position in the AppStore! In what position do you appear in different Countries and Different Keywords/Charts? On your iPhone you can only search your local store. Now you can search any store word wide (USA, UK, France, China, etc.). Search by Keyword or by Chart Category. Keyword Spy will give you the position of your application for various countries around the world. The searching takes place in real time so that you can monitor your positioning every day! 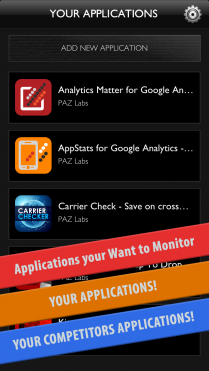 Add the Applications that you want to monitor its Keywords and Charts. You can add your own or competitors. Select the Countries that you wish to monitor the Keyword/Chart Results. Countries are separated and organised in the following Regions: Africa, Middle East and India, Asia Pacific, Europe, Latin America and the Caribbean, The United States, Canada and Puerto Rico. Select the Keywords that you wish to check their Rankings. You can select multiple keywords to see results. Select the Chart Categories that you wish to monitor. Again you can select multiple categories. Results show the Keyword Ranking and Chart Position for all the Countries that you have selected. After the Rankings show up you can click on the position result in order to see the actual App list for the specific Country and the Specific Keyword. 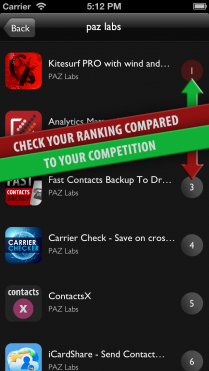 This way you can see where your competitors are standing.